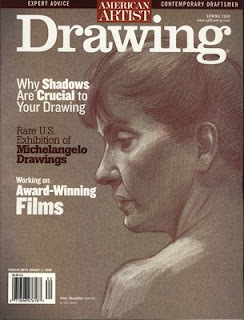 The Drawing Magazine is my all time favorite art magazine. When it arrives in my mailbox, the world around me completely stops while I leaf through it and decide which article I’m going to read first. So you can imagine how thrilled I was when they asked me for an interview. But I had no clue they were going to give me the spread that appears in this issue. I’m tickled to my bones!! It’s the Spring 2008 Issue, arriving in mailboxes today for subscribers. It should be on the news stands around the 13th of May. They also put some images on the American Artist Website. Thank you, Brooke! I checked out your deviantart page. Couldn’t figure out how to leave a comment there. I really like your work! Love the Sisters piece and the hatch line work on Heston. A lot of my colored pencil techniques are just an extension of how I work with graphite. So, as an already pencil pusher, you’re going to do great. Thanks for stopping by.